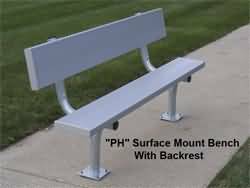 Our surface mount aluminum bench with back for sale right here is designed for outdoor commercial use & will provide years of comfortable, service at a low price. 6' L Surface Mount Bench With Back Seats 4, 90 lbs. 8' L Surface Mount Bench With Back Seats 5, 96 lbs. 12' L Surface Mount Bench With Back Seats 8, 133 lbs. 15' L Surface Mount Bench With Back Seats 10, 144 lbs. 21' L Surface Mount Bench With Back Seats 14, 211 lbs. 24' L Surface Mount Bench With Back Seats 16, 243 lbs. 40' L Surface Mount Bench With Back , Seats 26, 4 lbs.